Ever wonder what makes the difference between an average instructional session and an outstanding one? Raw talent and luck may be one reason but to design the “outstanding” consistently, you need a conceptual model to work from. 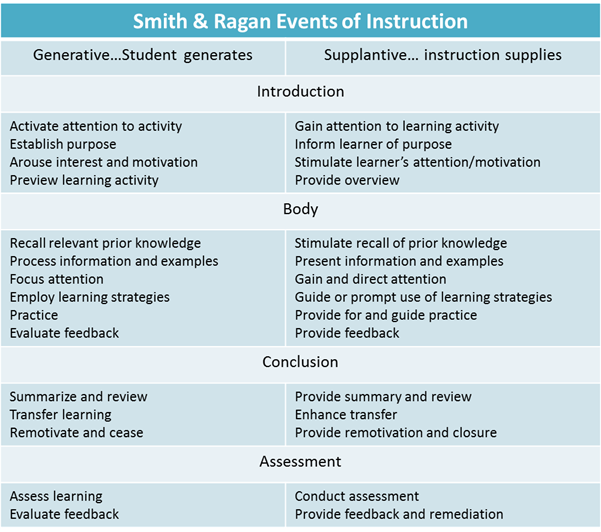 Somewhere in your Instructional Design Process you will need to plan what is going to happen in the learning environment to aid learning; the “events of instruction”. This post will focus on the tools available to the designer when creating a learning environment. This post will build on the July 2012 post on Learning Theories and Instructional Design. Recall the mantra, “…designed instruction must be based on knowledge of how human beings learn.”(1) A learning theory delineates the processes used to teach, it provides a conceptual model of learning. 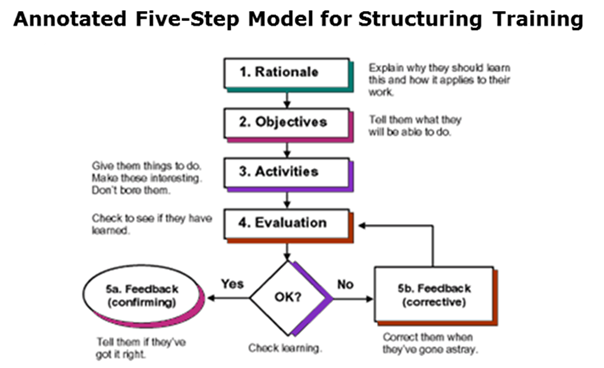 The model specifies the strategies and tactics used within a learning event. A model is like a road map because it lets you decide your path and helps you know where you are along the way to your destination. Just like there are multiple theories about how humans learn, there are corresponding models for designing instruction for each theory. So which one is the right one? Just like each learning theory has its strengths and weaknesses, so does its corresponding learning model. How do you choose a model? Finding the one that works for you will depend on how experienced you are at designing instruction in the same way of how well you know your way while traveling to a destination. The less experienced you are a more a detailed map will be helpful. In addition the roles of the instructor and the learner can differ greatly depending on which theory you choose and you may find yourself challenged to take on a different role. An example of a general model is the one offered by Stolovitch & Keeps in their book Telling Ain’t Training (2). It shows the steps to follow for each learning objective and offers general guidance on what should take place at each step. See the graphic below. One of the more detailed models is the Smith & Ragan Model. It has fifteen “events of instruction” and offers detailed strategies and tactics depending on the type of learning outcomes you are planning for. Jonassen & Harris (2) offer the following to clarify the concepts of strategies and tactics. “In a general sense, strategies are a set of decisions that result in a plan, method, or series of activities aimed at obtaining a specific goal. Tactics are specific plays or interventions in the process that are used to enact the strategy.” For example, an instructional strategy would be to “gain the attention of the learner”. A tactic for implementing the strategy would be to “pose a question to the learners”. They are all available via on-line book sources and/or in the HAMMER Safety Library. The next time you finish an analysis and have a good idea of what the content will be, review the different learning theories and determine which one fits the best for the learning outcomes you are going to design for. Then select a theory, find a model and try to apply it for at least the first four learning objectives. Or, take one strategy and try a different tactic. 1. Gagne, R., Briggs, L., Wager, W. (1992). Principles of instructional design (4th Ed.). Orlando, FL: HBJ. 2. Stolovittch, H. D. and Keeps, E. J. (2002). Telling Ain’t Training. Alexandria, VA. ASTD Press. The Cambridge Handbook of Multimedia Learning. (2005) Mayer Richard, E. Editor. New York, New York. Cambridge University Press. Patricia Smith was my professor at UT Austin. So glad her work is still foundational in our field.